Forward who played one year of college basketball at Duke University before declaring for the NBA. 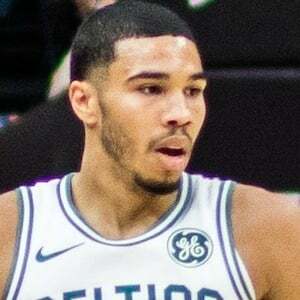 He was selected 3rd overall in the 2017 NBA Draft by the Boston Celtics. He began playing basketball at an early age. He first gained widespread renown for his play at Chaminade College Preparatory School in St. Louis, Missouri. He played in the 2014 and 2015 FIBA Under-17 and Under-19 World Championships, respectively, for the United States. He was born to Brandy and Justin Tatum. He has a younger brother named Jaycob. He has a son named Jayson Jr. He was selected after Markelle Fultz and Lonzo Ball in the 2017 NBA Draft.